Soon to be released as a live action movie, Battle Angel Alita remains relevant to our time even though it was first released in 1993. The main story is based around a few key characters, namely Alita / Gally (a warrior cyborg who has both names depending on if you read it in English or Japanese) and Daisuke Ido (a cybernetic doctor) and is set in a far future scrapyard that lies beneath a mysterious floating city. Alita is first found in this scrapyard by Ido, half broken and barely functioning with no memory of her past. Seeing her potential, Ido rebuilds her body and quickly the pair discover that she is a perfect fighting machine. In short she goes on to find many opponents to fight and as she does so she uncovers deeper memories of her past. The reason I skip over the plot like this is because the story itself is actually not so special. Battle Angel Alita is a pretty typical 'powerful hero punches stuff, stuff gets stronger and so does the hero' kind of story. What is great about Battle Angel is the way it explores the power struggle between the scrapyard city and the floating city while also asking what it is to be human. 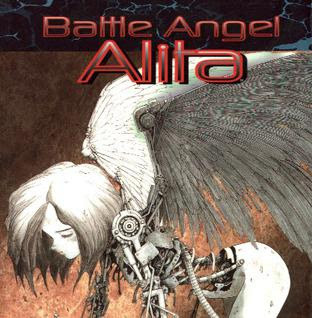 In a world where some of the inhabitants are little more than a brain in a machine, Battle Angel is well equipped to challenge exactly how we look at ourselves and how we define what it is to be us. Alita is pivotal in both aspects of this exploration, being on both sides of the fight at different points in the story while also questioning if she is the machine or the flesh, while contemplating which makes the other stronger. While as I said for the most part the plot is very typical, there is a reason I've given it 8 out of 10 but I really really don't want to hint at what happens to give it that score. Trust me though, you will not see it coming! As I said, this is still a very relevant story for us as we can see a very plausible future within the pages of Battle Angel should we fail to use our precious resources more wisely. It is also a very strong warning against mindlessly selling your effort to those above you for a meager slice of the reward when they have no real care or consideration for your own well being. Battle Angel is by no means a communist / socialist manifesto, and even the idealized society presented still runs on a capitalist structure of work and wages. It does however present the idea that there needs to be a fairness and a balance to it all, that the worker has a higher value than the one often given and that this can lead to a rather bloody uprising if not rectified. For all the darkness in the story, I like to think that really it is a story of discovery and hope. We are free to define ourselves by our own feelings, and even should these change from one moment to the next there is nothing wrong with that as we continue to grow and search for our own meaning of self. Of course as a manga it should also be mentioned that the artwork itself is rather spectacular and is similar to the Bladerunner movies when considering how it subtly builds a world for you around the story. There are many splash pages bursting with seemingly needless details, but without them our sense of feeling for the world of Battle Angel Alita would be all the poorer. As a graphic medium, one of the greatest challenges is balancing the written elements against the drawn. Battle Angel has few issues in this department and rarely does one fight against the other. The result is this beautifully crafted story that is a joy to read from start to end.